Hey Mercenaries, we know you enjoy hearing about the game’s progress and we really enjoy sharing our story with you, but lately we’re just so focused on the game that we haven’t taken the time to write another blog. The Ships 2.0 update has proven much more complicated than expected. It literally affects everything in the game, so we’re taking the time to ensure we implement it correctly. And because it affects everything in the game, everyone has to make sure they understand how it affects what they’re working on. This is mostly exciting as it means that a desired feature will finally work as intended, or what’s already there will just work better improving the overall experience. Occasionally, it’s more of an “oh, wait, that means we have to …” add another multi-hour task to the production schedule. Which is all a lot of context to simply say, we really appreciate your patience! In my last post I discussed the thermal systems and how heat management affects gameplay in the combat simulation, and ship customization. This time I am going to discuss armor and how it keeps you safe, as well as some future plans for the entire system. The first is what you would assume: providing protection from enemy weapons and all of the environmental hazards of space (radiation, micrometeoroids, and other debris). As with every other system, armor also has mass, which means the more of it you have, the more energy is required to move your ship. To maintain the same performance you’ll have to increase the available power (requiring more mass) and/or increase the available propellant (requiring more mass). This is why it’s called the “tyranny of the rocket equation”. If you put too much armor on your ship, your maneuverability will be reduced so much that you become an easy target - putting you at greater risk than if you’d gone without any armor at all. We want every decision you make to be important and have a noticeable effect, that includes armor. So let’s get into some details about how armor is simulated in the game, starting with the armor mesh. The armor mesh is the physical representation of the armor in the game. It divides the armor into separate pieces, and tells the game where each of these are, what they are made of, and how thick they are. Currently, these are all set by us, and we chose a good balance of survivability and mass, but soon players will be able to adjust these according to their own preferences. From my perspective, this system is a masterpiece of coding. It is intricate and detailed enough to give us the stats we need for combat without having to destroy computers in a blaze of glory to get it. Consider that the damage model must account for elastoplastic deformation (from slow shots, like artillery), hydrodynamic damage (from high speed kinetic impactors, like railgun rounds), outgassing (from vacuum), thermomechanical shock (from explosives), and pressure ablation (from lasers), as well as impulsive shock (from nearby nuclear detonations). To make sure that as little as possible needs to be done at runtime, the design and science departments did as much of the heavy math as possible before we even get it in game. The sheer amount of formulas we came up with and tweaked is astounding. Below are several images showing the armor meshes. Generally speaking, damage response depends on three factors: how is the armor built, what is it made of, and what is its current status? With few exceptions, all armor in the game is spaced armor, where the armor is split into multiple layers separated by gaps. The benefits of this arrangement are enough that it’s been applied in military vehicles on Earth for some time, but in space it’s even more essential, and it’s already being applied to real spaceships. 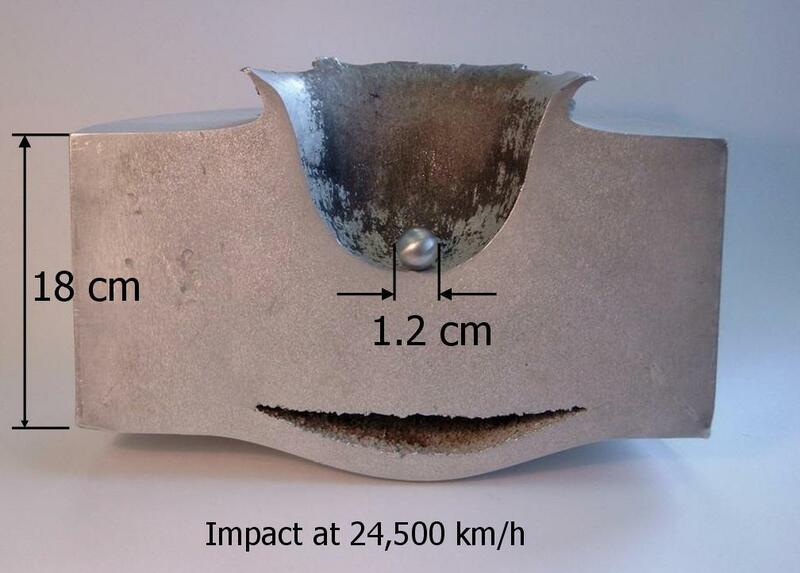 At orbital velocities (and those of railgun shots), projectiles hit so hard they enter the hydrodynamic regime, where materials start to behave more like fluids than solids, and so can penetrate incredible distances while excavating enormous craters. Spaced armor uses this very property to its advantage. In the hydrodynamic regime, the projectile starts behaving like a fluid and breaking apart too, so by spacing separate layers apart, the first layer causes the projectile to break apart, even as it’s travelling through the gap. By the time it hits the second layer, the failing bits might just splash off. At the very least, they will have broken down to much smaller less damaging parts. Of course, things rapidly get more complicated. Consider that larger and harder projectiles will break down less, faster projectiles can cross the gap in less time thus getting less time to break down, larger gaps give more time to break down, more layers can induce further breakdown… and that’s not starting with how the projectile burrows into the layers themselves. All of this is accounted for during calculations, including the special case when there is no spacing. The greatest variability comes from the material system, where each armor piece can be given its own material. There are currently over 30 different real world materials in game with a planned amount that exceeds 80! Each material has a large number of properties - density, specific heat capacity, yield stress, elastic modulus, melting point and enthalpy, vaporization point, emissivity, and a few other parameters that can condense some equations without destroying your computer. These allow players to choose what values they want to prioritize. Are you never getting hit by projectiles, but lasers are making you sad? Go with carbon nanotubes, which easily radiate accumulated heat. 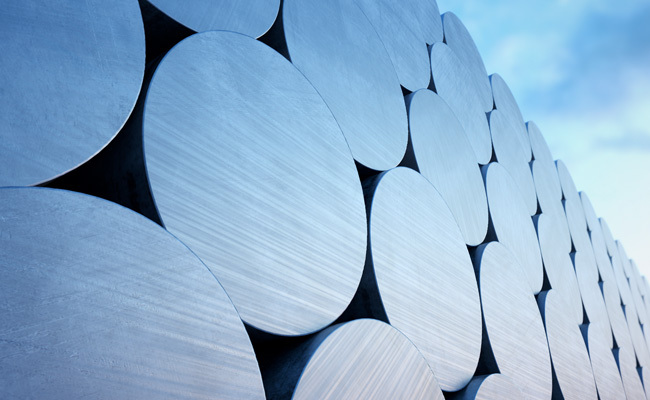 You can also choose high carbon steel, which has low emissivity and thus absorbs less of the energy from a laser in the first place. Are you really slow with a large striking surface area? Take a super dense material that is much harder to penetrate. When we have the ability to change every little piece, you can mix and match materials, for instance using lower strength but lower density materials for hard-to-hit parts so you can cut back on mass. These are the decisions that we want players to be making and a large part of the reason that we put so much detail into the game. There is no dedicated “health” system in-game; instead, each part has its mass tracked, with mass subtracted as it sustains damage, and total mass loss leading to a lost part (and a gaping hole in your armor). Having more armor mass means that there is more to chew through before you are in danger, but it comes with a heavy price. The more mass you have to carry the lower your acceleration, and the less delta-v you’ll get out of your propellant. Playtesting has shown us that managing propellant is one of the first challenges for new players to get the hang of, and propellant may be the game’s most limiting resource. The root of the problem is simply the fact that in most games, you are required to hold down a key or button to maintain forward motion. But in a spacecraft applying constant thrust isn’t necessary. Once you’ve reached your desired velocity you must stop thrusting. Otherwise, you will continue to accelerate and will typically find yourself departing the battlespace with little to no chance of getting back into the fight...possibly causing a mission fail, and definitely hurting your in-game reputation. Also, constantly accelerating not only burns through your propellant, but effectively carries a doubled cost, as it takes almost as much to slow down as it does to speed up. The only reason it’s not perfectly even is that as you burn propellant, that reduces the overall mass of your ship that you need to slow down. As such, managing your mass to maintain your delta-v and thrust is essential to efficient cost-effective combat operations, and is going to be very important to your bottom line as a private military contractor. Currently, armor material is the main choice that players can make in regards to armor. Another major option we want to give players is the ability to add extra armor over the specific parts or components that you want to protect. This will allow players to find their own sweet spot between protection and mobility, as well as carefully tailor their ships armor to defend the parts they deem most critical. In this regard, we were inspired by the story of Abraham Wald who armored planes in World War 2. Much like spaceships, airplanes can’t carry too much armor or they won’t be able to move, so the United States military had to be very selective about how they armored their bombers. 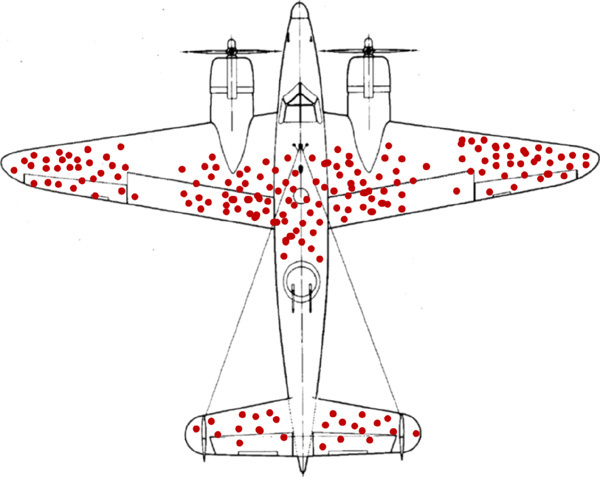 Looking at bullet holes on planes that made it back from engagements, they asked a military group of statisticians (including Wald) how they could more optimally armor their planes. 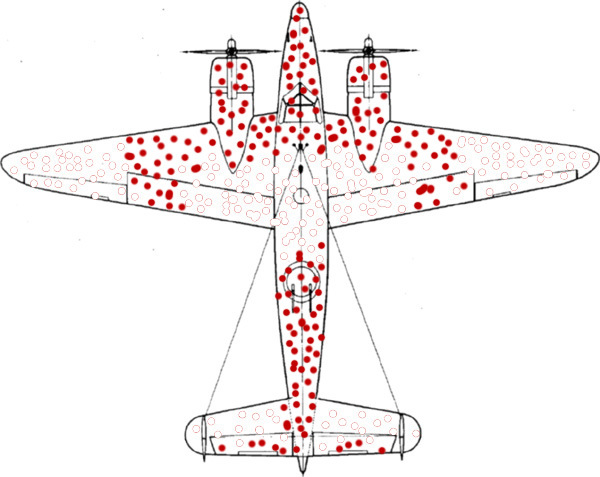 The holes were almost evenly distributed except around the engines, which had barely any holes at all, so they figured to armor the rest of the plane which seemed to get hit more. Wald stepped in: “Put the armor where the holes are not”, because the planes that did get holes in the engines are the planes that didn’t come back. Perhaps players will soon say, “I really need more armor covering my reactor” because they find that getting hit there is worse. Customization is a core element of our game and we want players to make informed decisions that have actual impact on their game play. As with every other ship system in our game, we want players to feel like their choices about armor are meaningful and, made wisely, can give them a tactical advantage. Armor is at the intersection of multiple systems, so we want to make sure that players have a reasonable amount of control over it. Outside of just number improvements we want the feel of a ship, how it handles and accelerates, how it balances its thermals and power to be almost as important as a player’s skill in combat. We think our armor mesh system is amazing and our tech department absolutely knocked it out of the park. We look forward to hearing what you think of it when the update is released. Impressive..... i look forward to this even more now. I am glad you like it. The next time that I write up a post I will go over projectiles and go into more detail there. also Abraham Wald was a genius.. pretty much set the standards for where we armored our helicopters for combat.